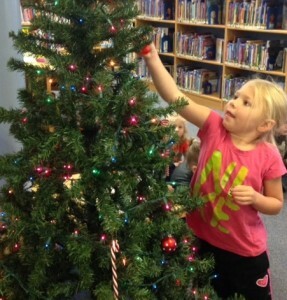 This week we invited kids to attend a crafting and Christmas tree-trimming party at Carlsbad Public Library on Tuesday, Dec. 9. The event was organized as a come-and-go activity from 9:00 a.m. to 12 noon. 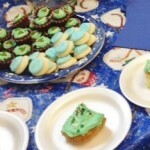 We had 73 guests participate and enjoy holiday music and homemade treats donated by the library staff–from brownie bites and Christmas cake to gluten-free frosted sugar cookies! Children and parents could choose from several different crafts to make, including a craft-stick reindeer, torn tissue paper wreath, a beaded wooden ornament, paper chains, coloring pages, and a paper Christmas tree to decorate with sequins and other embellishments. 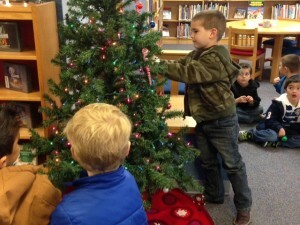 Some kids chose to make all the crafts, while others made one or two things and then read Christmas books or put puzzles together. 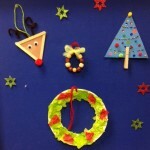 Each craft was set up at a different station, and all crafts were age-appropriate for children ages 3 and up. The library staff also had a basket of ornaments available for children to hang on the lighted tree in the children’s department. Some kids chose ornaments from the basket, while others brought an ornament from home or hung up ornaments they made at the party. A special treat for me was hearing some of the kids from a nearby preschool sing a couple of Christmas songs they had been learning in class. Thank you, Beth, for sharing your wonderful holiday event with us!